1:56 I like the scenery in the background. 1:59. Someone's pet platypus? Good Morning, Wolf, Anne and all. Everybody!! Am so tired of smoke. Me too, Denny, but I remind myself how lucky I am that I didn't live in Paradise. I am relieved you guys are just dealing with smoke. The fires are horrendous. It's terrible what happened/is happening in Paradise and other areas. Stay safe and keep checking in so we know you're okay. Hello Wolf, Anne, Tom, Hal, Denny, Pikers, Keith, Kathy & Shosho - and also to those who stroll by later! Vici for the great photo of the platypus. 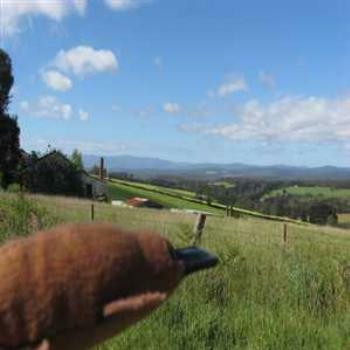 Morning all, a well traveled platypus admiring the view. Another easy 1-9 puzzle today. Bit far to amble today so Keith, it's up to you. Hope your smokey air is not having a bad effect on you. Good maeN 👋🏻 Quick puzzle and now off to bed - read a bit. It feels like I have the place to myself. I dropped by several times as the day went on, and could tell how slow it was. Another cute picture by Vici. I miss her stopping by. I just missed out on out-gallumping you Keith. I hope the smoke is clearing away, and not being replaced by fire of course. I hope that Denny is safe too and the atmosphere is improving. We had a rather menacing fire on the outskirts of Canberra. It took several days to bring it under control and it may still be smouldering. It was started by someone who stole a car and drove it into some bushland and set it on fire. It almost seems it is a rite of passage among some groups.